When I was a kid, I remember my father bringing home a coconut once or twice as a novelty. He used a screwdriver to knock a hole in one of the three dark spots at the end of the coconut, then drained the milky liquid into a cup. After we had shared the drink, he busted open the coconut and we ate the white meat inside. It was fun. I liked it. Now I am in the land of coconuts; there are coconut palms growing everywhere you look. But any Malaysian reading this would think we were absolutely crazy. No-one would dream of doing what we did. There are uses for almost every single part of the coconut palm (something I hope to write more about soon), but the unprocessed meat is considered inedible. The principal way coconut is used in Malaysian cooking is through the coconut milk, called santan. Santan is not the clearish water in a mature coconut that I drank as a kid. That water is also considered unpalatable and is usually discarded. Rather, santan is the liquid obtained from pressing shredded coconut meat. It is a thick, creamy white, extremely high in fat. It fills the role of butter or cream or soup stock in cooking. It is an essential ingredient for Malay cooking. An old lady told my wife once she doesn’t know how to cook if she doesn’t have two coconuts in the kitchen. It is the base for most sauces, a part of most desserts, and is used to make the rice in the breakfast nasi lemak, which is the eggs, hash browns and turkey bacon of the Malay diet. Santan can be bought in tins, in powdered form and fresh frozen in packets. Those with a little more time to spend can buy shredded coconut from the market and press it themselves. Back in the states, we had to settle for tins. It was miserable for my wife. Being from Bagan Datoh, the coconut basket of West Malaysia, not having fresh santan made her unsatisfied with everything she cooked. At the time, I didn’t know the difference. After coming to Sarawak, we would buy shredded coconut. But before long, it stopped satisfying. There was only one thing to be done: get our own coconut shredder. And we did. Now, all her cooking is preceded by santan preparation. And here is how it works: we buy coconuts in bunches of four, with the fibers (sabut) still attached to the top, covering the three holes. This keeps the coconut fresh. That is one reason you can’t get good coconuts in the states – the coconuts are bald. These days they are often scored around their middle to make them easier to open, but it probably reduces their shelflife further. When she wants to cook, I peel off the fiber covering. That goes in the compost pile. Coconut fiber makes awesome compost. Then I bust open the coconut using a handy kitchen-sized parang. Often, I capture the water and drink that. What can I say: I’m a product of my environment. Then, the coconut goes to the mighty coconut scrapping machine. This monster is built for a single purpose: making short work of coconuts. The business end is a fist-size ball of metal with dozens of sharp spikes. 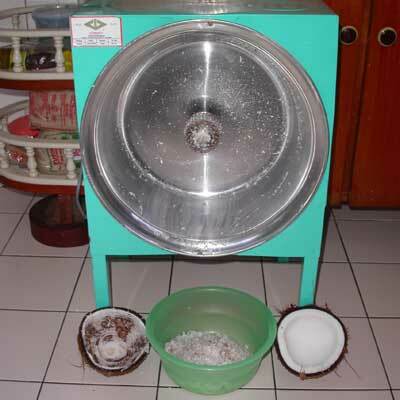 The coconut shell is pressed onto the whirling ball and in about 15 seconds, you have shredded coconut. This is just the homeowner model of course. For commercial santan production, a top-feeding model is used. That one is much safer in theory, since the meat is just dropped into a chute. This one definitely has safety issues. There is no way it would be approved for sale in the states. Since you have to press and hold the shell while the blade spins, your fingers are only a half-inch away from being shredded too. Since we got it, it has already nicked our maid and my mother-in-law. Consequently, I do all the shredding now. I’m expendable. After the coconut is shredded, the meat is squeezed by hand through a seive, adding a bit of water to move it along. I’d say one average coconut yields two tins of santan like the kind we used to buy. Is it all worth it? Oh my yes. It is cheaper this way; the machine will have payed for itself in a year. But I wouldn’t do it just for that. The difference in flavor and aroma is amazing, especially for kueh and nasi lemak. I don’t care to eat nasi lemak outside anymore. It doesn’t have the lemak! Salaams. Here in the West Indies the green coconuts are cut to drink the water and eat the jelly. We don’t drink the water if the jelly (meat) is hard. But the other uses are pretty much the same as described. Jordan – Thanks for noticing. Yes, still blogging, just on a greatly reduced schedule. All free time has gone to the yard project, which I’ll be blogging about in gratuitous detail as soon as the monsoon season stops me from working any further on it. Chanol – I attended an all day conference on Palm Oil, can you believe that? I learned that palm oil won the “fat wars” with cottonseed, peanut and canola: scientists concur it is the best oil, just like smaulp said. But palm oil is not the same as coconut oil! I’ll blog about that one of these days… How’s the wife and kid? Rose – Are you from T&T by any chance? Oh yes, there is nothing better than a young coconut. It is a popular drink here in Malaysia too. It is often served with a small bowl of sugar syrup, so you can sweeten to taste. But I’ve heard from some people that it is not good for *ahem* men’s health… What’s the word ova dey? I have just moved from KL to Kuching about 7 months ago; i like to read your blog – quite interesting the way you describe malaysian/kuching culture. And I find it interesting and understanding of being to blend in here. Hit the location on the spot. But never heard that story being told about the poor coconut! And to think how trinis love their coconut water! Rampay is also known as pandan. Glad to see you’re writing again. One of my earliest childhood memories is of me standing in the kitchen watching the maid parut kelapa. The coconut scraper was built to look like a four-legged animal, hooves and all, and to scrape the coconut you’d have to sit yourself on its “back” and stretch out your hands towards the metal scraper placed where the “head” would be. Scary looking thing, but today I would give my eye teeth for one just like it! BTW according to Dr. Bruce Fife, president of the Coconut Research Center, coconut oil is a miracle potion that, taken as a supplement or used in cooking, promotes weight loss, protects against cancer, diabetes, heart disease and aids digestion. Who knew?! i was once told that Borneo was derived from buah nyior, another Malay name for buah kelapa or, as you say, coconut. it was during a history lesson when my teacher related a story about several travellers from Kalimantan who came to see a British colonial officer in Perak. the year was somewhere in the 1800’s and the officer was curious to know the origin of the travellers. not knowing exactly where they were from, the Malay translator of the officer told him that they came “dari pulau yang banyak buah nyior”. hence, Borneo. Hey, nice to have you back! I was about to send you an email to see if you had given up on blogging. As for coconuts, it still amazes me that I can get them from trees near my house, along with papayas, etc. Salaams- good to see you are back! At the Bawa Muhaiyaddeen Fellowship here in the states, we use cocoanut milk for khanji for break-fast for Ramadan. We used to have a sister who would grind the coconuts using handgrinders- and also get the kids involved- (you wind the handle which turns the scraper blades while you hold the coconut shell with the other hand). 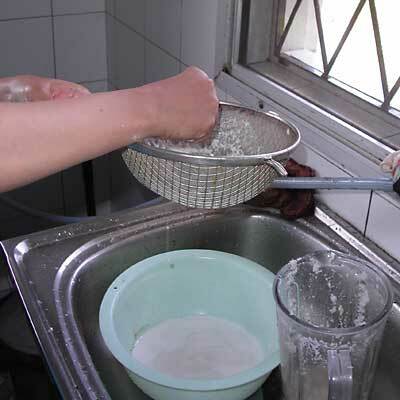 We blend the resulting shreds with water in a blender for “first and second milk” She died of cancer (may Allah grant her peace in the grave) and for the last two years we have been using canned coconut milk. These khanjis are so good, they have nuts and mung beans and veggies + the main ingredidant- rice. During the rest of the year we have regular khaji which has alot of garlic and also tofu. I make the Sat. khanji for after Fajir prayer and Zikr – the famous oatmeal khanji with Rampay. For awhile rampay was only available from Sri Lanka, but now we are finding it in Korean stores.